We celebrated our 20th anniversary in 2016! 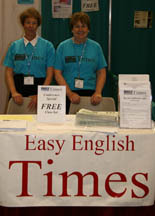 Easy English Times was created in 1996 to meet the need for relevant and current material presented in a "user friendly" format for ESL classes and adult literacy programs. It is used in colleges, adult schools, library, family and workplace literacy projects, and by citizenship advocacy organizations. Individuals also subscribe. Today Easy English Times is used by adults and junior high/high school students learning how to read English from California to New York, from Nebraska to Texas. An online version is also available for international readers. Many of our readers are immigrants new to this country. We are committed to publishing student writing, to sharing "ownership" of the paper with our readers. Left, above, editor Lorraine Ruston and publisher Betty Malmgren at a CATESOL conference. Publisher Betty Malmgren has a background in print journalism and has a master's degree in journalism. Editor Lorraine Ruston has years of experience as an ESL teacher and teacher trainer. She has a master's degree in linguistics with an emphasis on TESL. Circulation manager is Kathy Bandrowski. Left, Lorraine Ruston, subscriber Lance Belville, and Betty Malmgren, right.